It feels like an eternity since I last ran (before Labor Day). I was finally cleared last Tuesday to run outside. I’ve been kind of running on the AlterG treadmill. The AlterG is also called an anti-gravity treadmill. It calibrates to your weight and then you can set it to run a % of your body weight. I started running at 60% of my body weight and worked my way up to 80% with the running to walking ratio improving each week. The AlterG is a very strange feeling and I really had no idea what to expect once I was allowed to run outside. 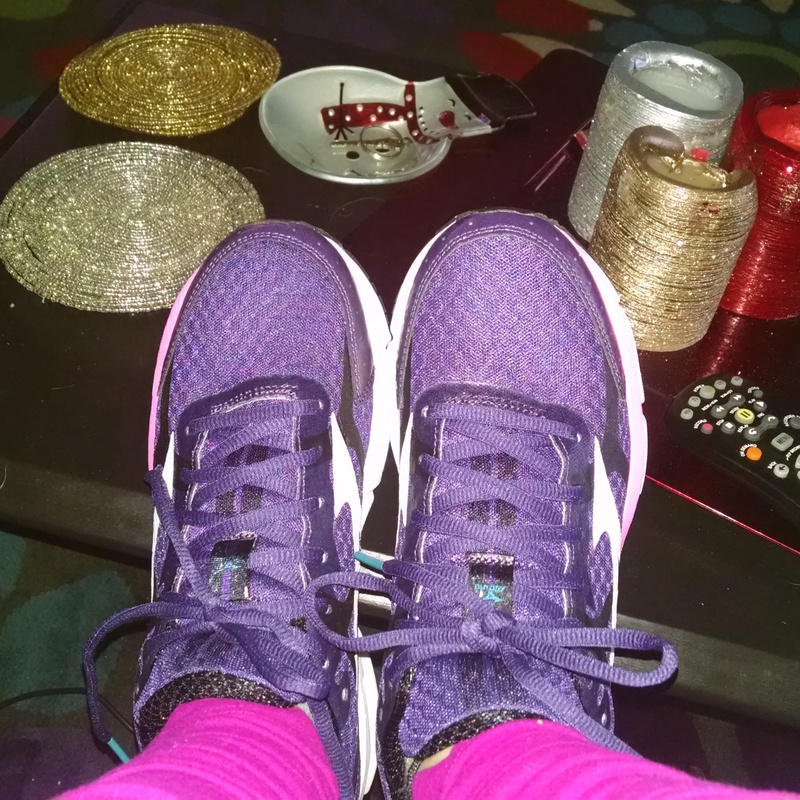 I did order new shoes as prescribed by my PT. I found a killer deal on last year’s model and was able to get them in a pretty purple. I’ve never been so happy to spend money on another pair of running shoes. Run is a very loose term here. My physical therapist has a get back to running plan, which starts with a high ratio of walking to running. I felt kind of ridiculous getting dressed to go walk 4 minutes/run 1 minute x 4, but it was something and we’re having unseasonably warm weather so I went. And it was amazing. I wanted to keep going, but really, really don’t want to get injured again so followed my stupid plan. I’m going to keep going to spin class at least two times a week. I’ve found the instructors that I really like and I know the cross training is good for me. I get to close out the year a runner again. No races for now and nothing crazy, but I’m running and it’s something. I can’t wait to get back out there. I’m setting exactly zero goals for 2015 other than to run healthy and happy. Previous postWill I ever run again? Let’s just say I’m glad insurance is paying for it. I will for sure be run/walking the Snow fun run. I felt the same way about getting ready for my walk/run but said screw it. I only get to run a tiny bit, but I’m going to enjoy every single step. Here’s to a healthy and injury free 2015!